Synopsis: In a dystopian future where genetically advanced Apes now rule the earth, Ape leader Caesar struggles with keeping the peace when a band of human survivors seek shelter and help from the apes. The last entry into the Planet of the Apes series (for now) which is a direct sequel to 2011’s reboot Rise of the Planet of the Apes, as we follow the aftermath of the events from that film. Mankind has fallen due to the virus which Will Rodman (James Franco) developed in Rise. This film is set ten years after the events of Rise and is essentially a remake of 1973’s Battle for the Planet of the Apes (which is a direct sequel to 1972’s Conquest of the Planet of the Apes which was also remade into 2011’s Rise of the Planet of the Apes. Make sense??) 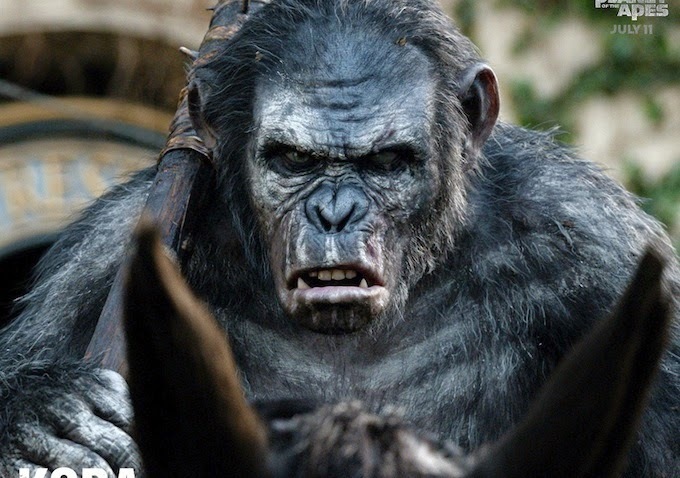 However whether you are a fan of the series or if this is your first ape film to see you will definitely be impressed with this epic tale filled with parallels to Shakespeare’s classic Julius Caesar, as well as modern news headlines including threatening viruses, terrorism, politics, global warming, fear of technology all wrapped up in a sci-fi cgi heavy blockbuster. 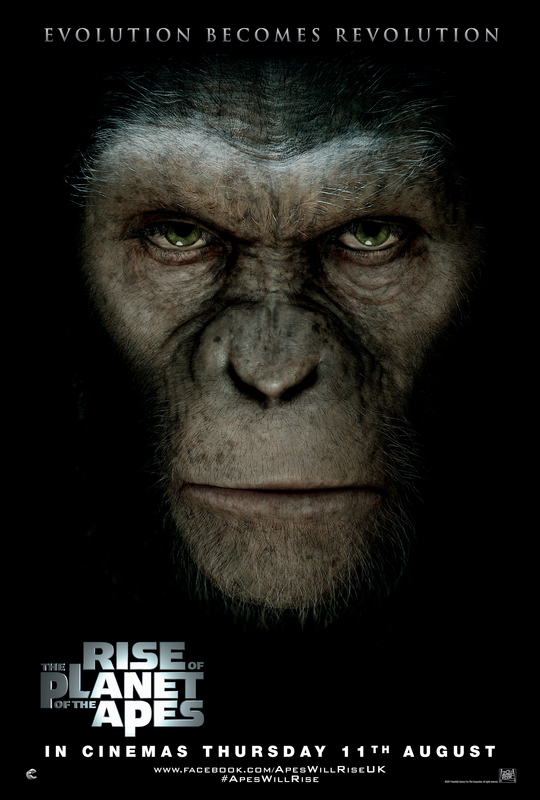 Andy Serkis reprises his role of Caesar from Rise of the Planet of the Apes. Caesar now leads his ape community with his right hand man Koba (played by Toby Kebbell) and Maurice (played by Karin Konoval). In the opening sequence he leads his army into an attack on some deer. 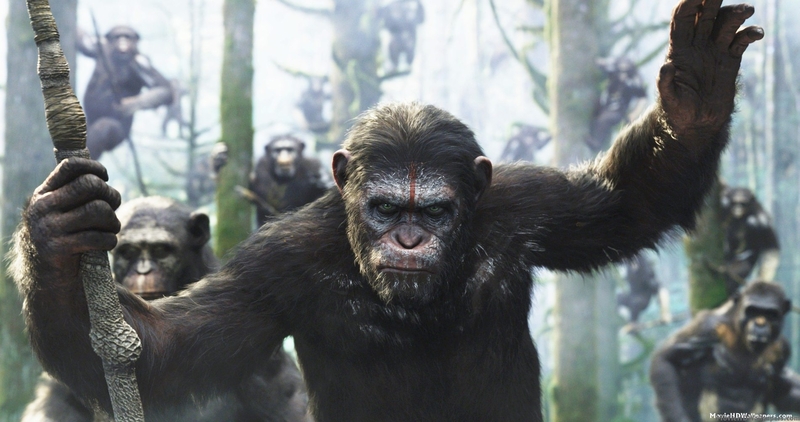 This sequence is breathtaking as the camera and sound follow Caesar and his apes into the forest. No dialogue only subtitles showing their communication highlight the sounds of the forest and its slow build-up of suspense and foreboding. The cgi is once again top knotch the geniuses at Weta have again sculpted living, breathing apes with actors portraying them through performance capture technology. Andy Serkis has already become a master in this medium with his iconic performance as Gollum in the Lord of the Rings series however who truly shines in this instalment is Toby Kebbell as the tortured Koba who hates all humans and begins to disagree with his leaders outlook. It is an iconic performance and is easily the best villain of 2014. 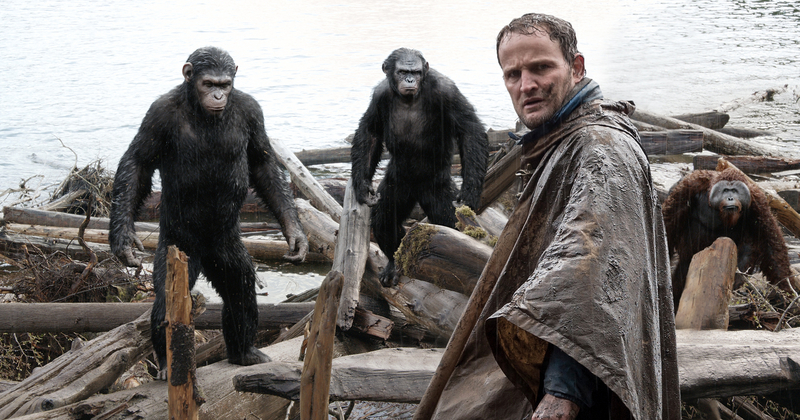 After the opening deer chase a group of humans lead by Malcolm (played by Jason Clarke) cross paths with the apes and seek help in order to bring back electric power to their small community of survivors. Caesar begins to remember the human who helped him as a child and helps out the group of humans in an effort to work and live together in peace. However with all great stories the search for peace isn’t easy and with man and animals nature peace can only exist in short bursts of time. 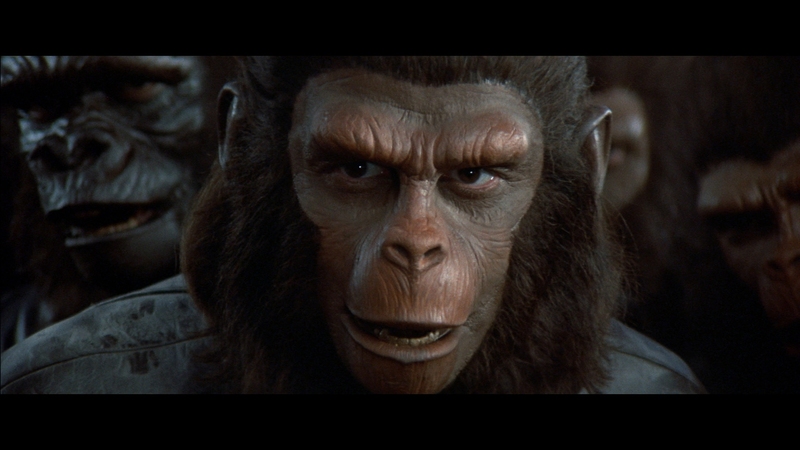 Soon Koba plots to get rid of the humans despite his leaders frame of mind. 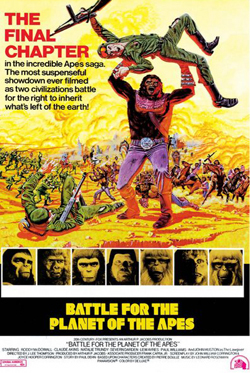 What ensues is an action packed final battle between the humans and apes. This film is brilliant, strong plot, characters, set design, special effects, sound design/soundtrack and direction. It is not an ordinary blockbuster and although previous ape entries have been parallels to our current time this one really gets all the beats right. 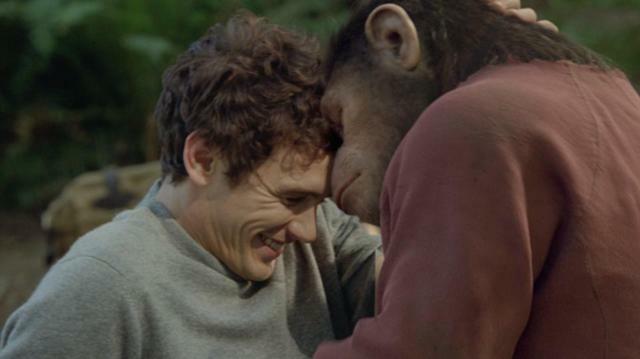 This is very high on the list of best films of 2014 and also very high on the list of Planet of the Apes films. Strong recommend. Maurice: Careful. Humans don’t like smart ape. After 2001’s reboot directed by Tim Burton bombed critically and financially ten years later Fox decided to do another reboot. 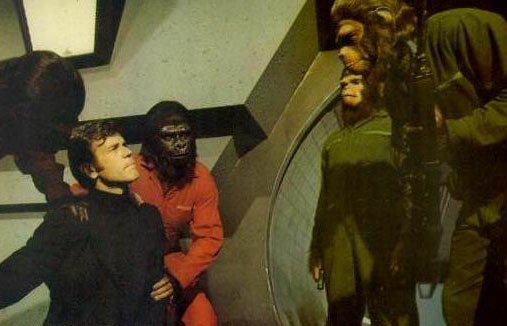 Only this time they moved away from remaking Planet of the Apes (1968) and made a hybrid prequel/remake of Conquest of the Planet of the Apes (1972). 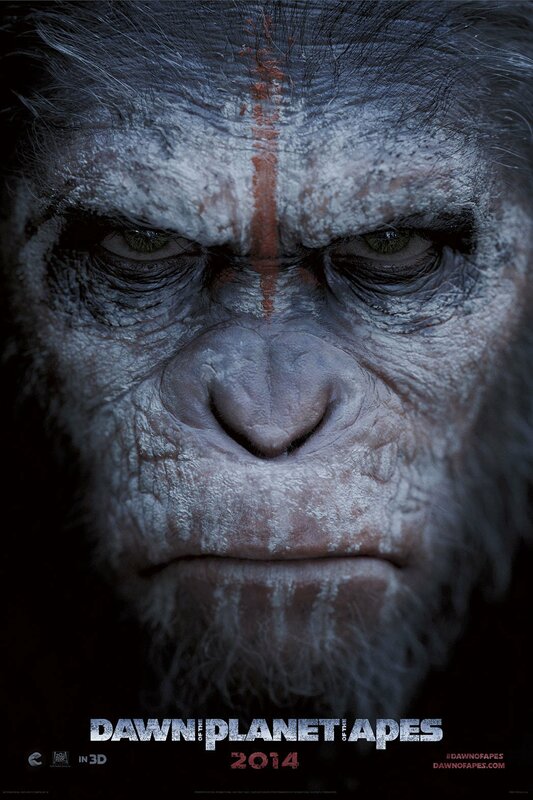 The one thing that differentiated it from the franchise (and had fanboys quite worried) was the fact that all of the apes would be completely CGI and not men in costumes. Although the one thing everyone praised in Burton’s reboot was the amazing costume design. This film opens in the jungle and provides a far more serious and compelling opening far removed from what we have seen in the past films. Thanks to the geniuses at Weta Digital we have amazing looking apes who look more like they are from a David Attenborough documentary than a Halloween party. The apes look and move exactly as real apes do and this opening is brilliant in showing not only this new universe but also the new tone this film/franchise will go in. After the jungle sequence opening we are introduced to Will Rodman (played earnestly by James Franco) who is a scientist experimenting with cures for alzheimers. We quickly learn that Will has a personal stake in this as his father is suffering from the illness (played heartbreakingly by John Lithgow). Will has a lab full of chimps who have been given a serum that increases their intelligence and gives them the IQ of humans. After a presentation goes wrong the experiment is called off and the chimps are all euthanized except for one baby chimp which Will takes into his own care. As weeks go by Will discovers this chimp has the AZL serum in his blood passed down from his mother and shows signs of increased intelligence far superior than any regular ape. 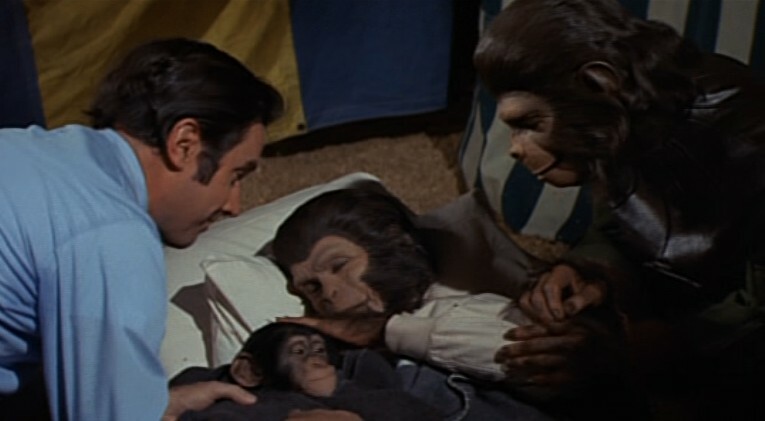 The ape also befriends Wills dad, Charles and he names him Caesar based on his love of Shakespeare. The famous Shakespeare play Julius Caesar definitely has parallels to this story. As years go by Will begins dating comely Vet Caroline (played by Frieda Pinto) and Caesar grows claustrophobia as an ape with no jungle to explore. He watches outside the attic window at children playing and becomes depressed in his current predicament. Will begins to take him on trips to their local sanctuary where Caesar is able to climb trees and swing from the vines. These sequences are breathtaking and show the scope of the quality of Weta’s special effects. As with every Planet of the Apes film things soon begin to go wrong not only for Caesar but also for Will and Charles who begins to slide further into madness. Caesar ends up in a zoo owned by the nefarious John Landon (played with moustache twirling glee by Brian Cox) and his son Dodge Landon (played by Harry Potter villain Tom Felton). Here Caesar meets Maurice and Rocket and many other apes and begins to find a place among his primates. He soon becomes King due to his advanced intellect. Unfortunately Caesar also learns the evil of men and becomes distrustful of Will and sees his fellow apes as his equals. He rallies them together to rise up from their cages and take over the city. The action and special effects filled sequences that follow are truly breathtaking especially the action on San Francisco’s Golden Gate bridge. 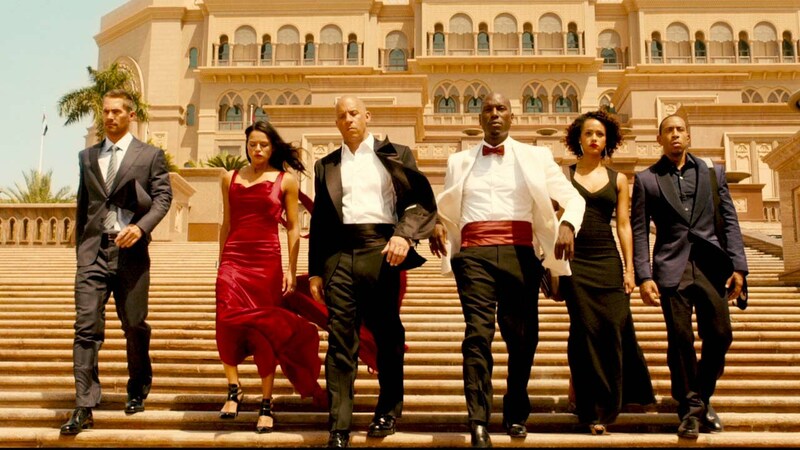 The film is ultimately a tragedy and shows the problems with our modern society between different classes, ethnicities and groups of people. Also the cost of trying to advance science and technology to play God. The film is an allegory for many issues in today’s society and unlike the older Apes films it doesn’t hit you over the head with the obvious subtext. Instead it provides an action filled and at times heartbreaking story of man and ape who lose their way. One more thing I need to praise in this film and that is Andy Serkis motion captured performance. After playing Gollum and King Kong in Peter Jackson’s Lord of the Rings trilogy and King Kong, Serkis has made body acting an art form. He is brilliant in this role and brings the ape Caesar to heartbreaking life. You follow his journey and side with his character more so than any human performer. 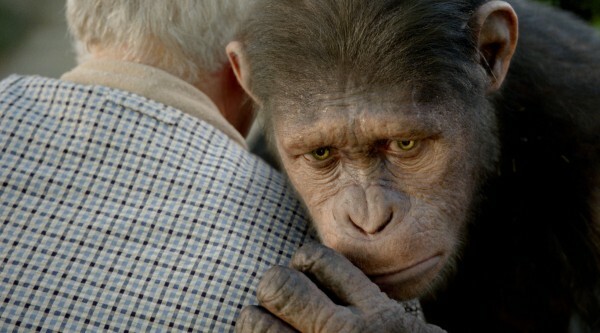 Serkis’ Caesar has become one the greatest CGI characters in the past five years. 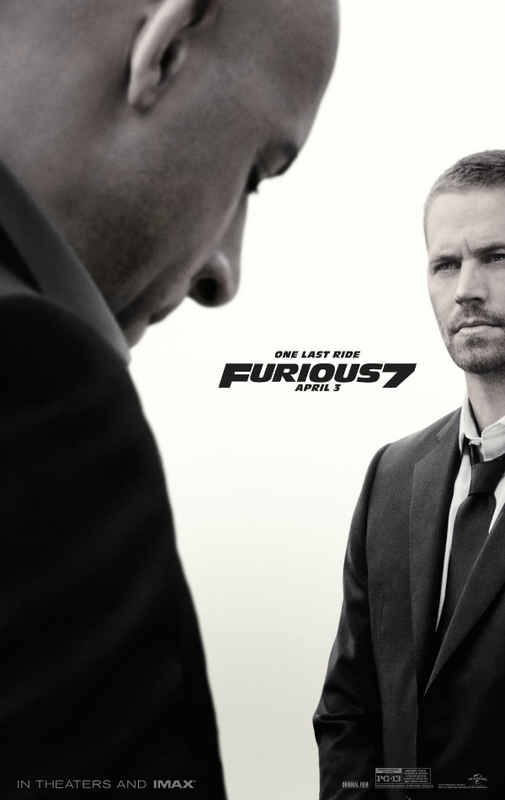 He is truly a revelation and lifts this film from enjoyable to fantastic. The Lawgiver: In the beginning God created beast and man so that both might live in friendship and share dominion over a world of peace. But in the fullness of time evil men betrayed God’s trust and in disobedience to His holy word waged bloody wars, not only against their own kind, but against the apes, whom they reduced to slavery. Then God in his wrath sent the world a saviour, miraculously born of two apes who descended on Earth from Earth’s own future and man was afraid for both parent apes possessed the power of speech. Synopsis: As Cornelius struggles to keep life peaceful between ape and man, a reckless militant gorilla named Aldo pushes war between the remaining humans on earth and the apes. A rather underwhelming final chapter to the Planet of the Apes series which began with 1968’s brilliant original starring Charlton Heston. 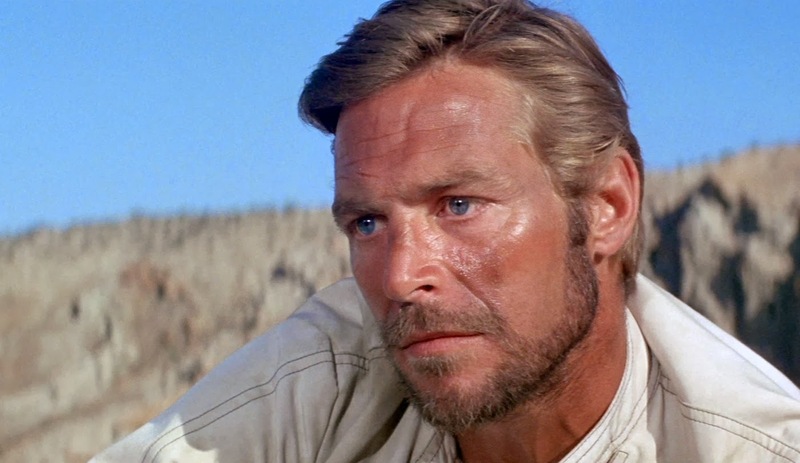 This seventies based series has a complicated history both on and behind the screens. 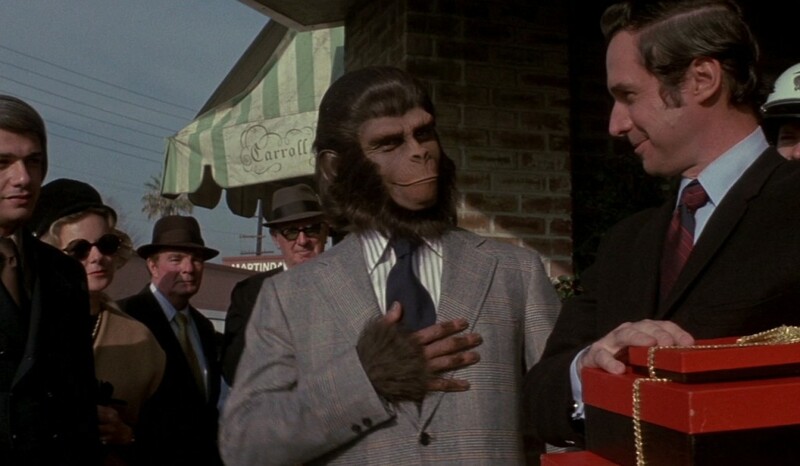 However all of the apes films were popular box office draws for Fox Studios during the seventies, with all of the films directed at families and sci-fi aficionados. The series popularised smart science fiction with social commentary, interesting characters and jaw-dropping twists in each film. 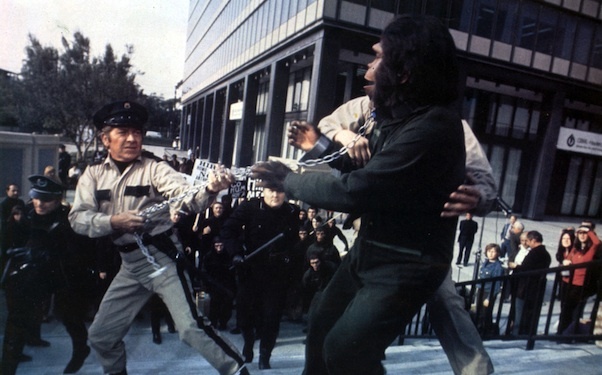 Battle for the Planet of the Apes unfortunately ends the series with a whimper. The plot revolves around Cornelius ruling a peaceful society where apes are the superior species and man helps out with laborious chores wearing scrappy torn clothes. Some humans allowed in Cornelius’s close quarters give insight to Cornelius regarding the ethics of society. The film overall looks a lot cheaper than previous entries, with costumes looking at an all-time low with the many apes wondering around the screen. The lighting is often bright and most of the scenes take place during sunny days which doesn’t do favours for the appearance of the apes. Militant gorilla Aldo looks the worst in a clearly plastic mask that doesn’t quite move right when he speaks. Cornelius fares better in his ape costume however also struggles with speech and emotion, unlike previous films where he looked quite good. 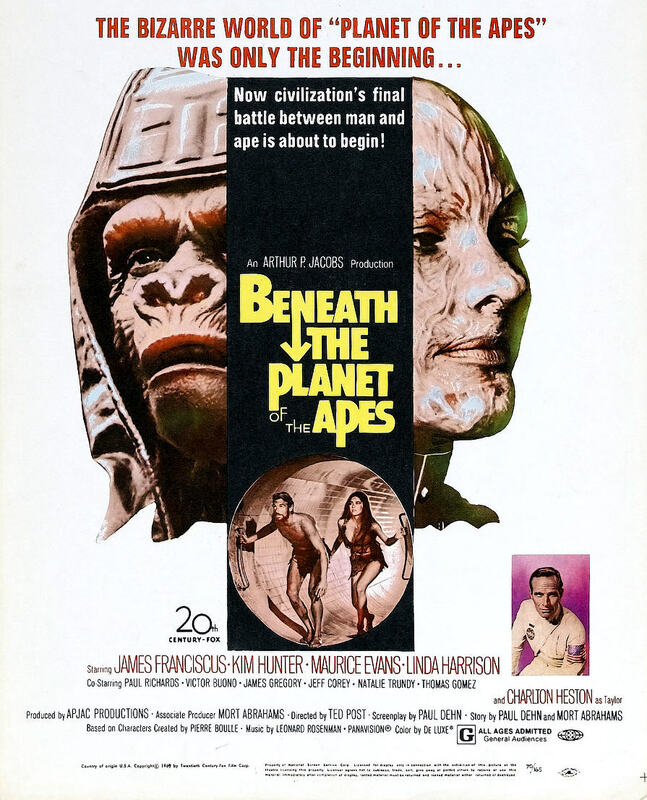 The plot is quite basic and the title is quite misleading as one would expect the apes in an all out war with humans eventually creating the Planet of the Apes that we saw in the original. 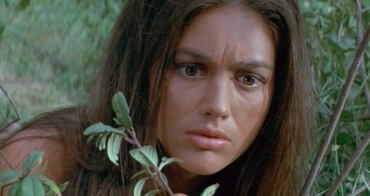 Instead the plot deals with Cornelius struggling with power and going on a search for his parents lost tapes that they filmed in the previous Escape from the Planet of the Apes. Militant gorilla Aldo causes most of the drama as he dislikes humans mixing with apes and wishes for them all to be destroyed. This leads to an inevitable battle between the apes with unsurprising results. Director J. Lee Thompson has lost the innovation he displayed in the previous film, Conquest of the Planet of the Apes, which was quite dark and violent in tone. In this film he shoots mostly in the light and creates dull action set pieces that look phony and outdated even for the seventies. 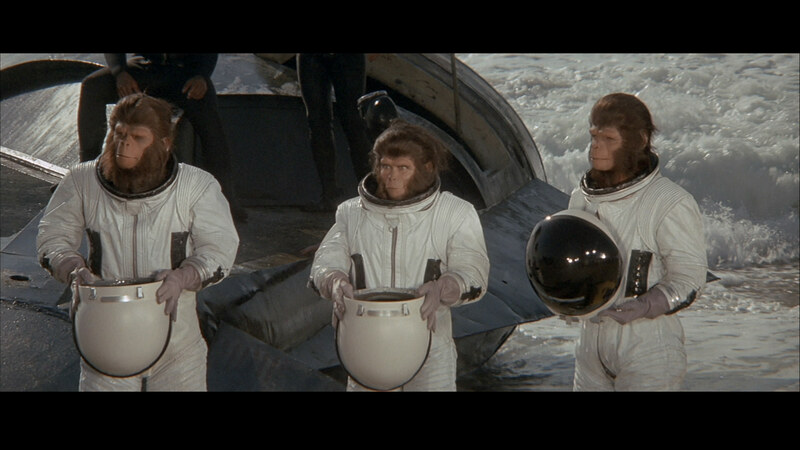 Perhaps the worst entry in the entire Planet of the Apes franchise. I would give this a miss and move on to the recent reboots instead. 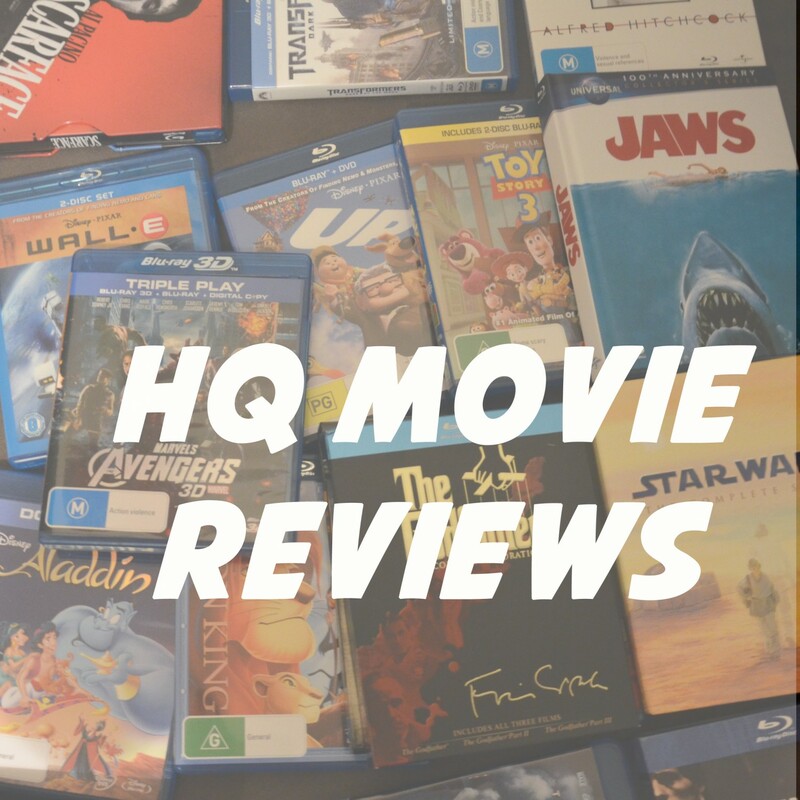 *Check out reviews for other films in this series below or follow the links. MacDonald: Caesar… Caesar! This is not how it was meant to be. Caesar: In your view or mine? MacDonald: Violence prolongs hate, hate prolongs violence. By what right are you spilling blood? Caesar: By the slave’s right to punish his persecutor. MacDonald: I, a decedent of slaves am asking you to show humanity. Caesar: But, I was not born human. MacDonald: I know. The child of the evolved apes. Caesar: Whose children shall rule the earth. MacDonald: For better or for worse? Caesar: Do you think it could be worse? MacDonald: An emperor ape might do slightly better? Caesar: Slightly? What you have seen here today, apes on the 5 continents will be imitating tomorrow. MacDonald: With knives against guns? With kerosene cans against flamethrowers? Caesar: Where there is fire, there is smoke. And in that smoke, from this day forward, my people will crouch and conspire and plot and plan for the inevitable day of Man’s downfall – the day when he finally and self-destructively turns his weapons against his own kind. The day of the writing in the sky, when your cities lie buried under radioactive rubble! When the sea is a dead sea, and the land is a wasteland out of which I will lead my people from their captivity! And we will build our own cities in which there will be no place for humans except to serve our ends! And we shall found our own armies, our own religion, our own dynasty! And that day is upon you… now! 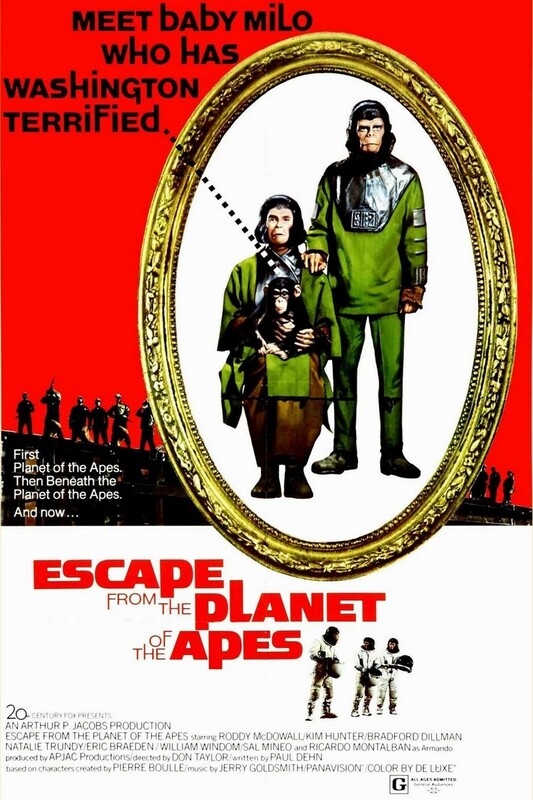 Synopsis: In a futuristic world that has embraced ape slavery, Caesar, the son of the late simians Cornelius and Zira, surfaces after almost twenty years of hiding out from the authorities, and prepares for a slave revolt against humanity. The film begins in a grim looking 1991, with now grown ape, Caesar, discussing the plight of the apes with his owner/mentor Armando (Ricardo Montalban). We discover that since the dogs and cats have been wiped out by a deadly virus, apes have become groomed to replace them as home pets. However as time went on the apes became used as slaves rather than pets. They are used to clean the house, prepare dinner, etc. Eventually they became used for more menial jobs such as janitors, waiters and cleaners. The parallels to the plight of minorities in America are quite heavy handed in these scenes. 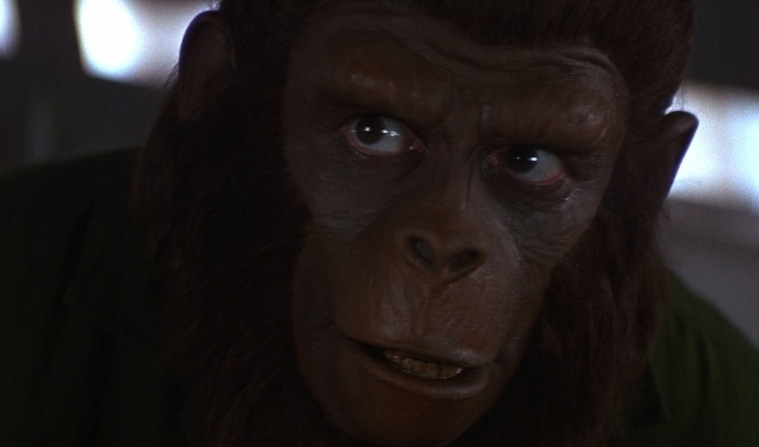 Caesar however who was born from Cornelius and Zira in the previous film has advanced skills and knowledge and has already evolved to a more humanoid ape similar to his parents who were from the future. 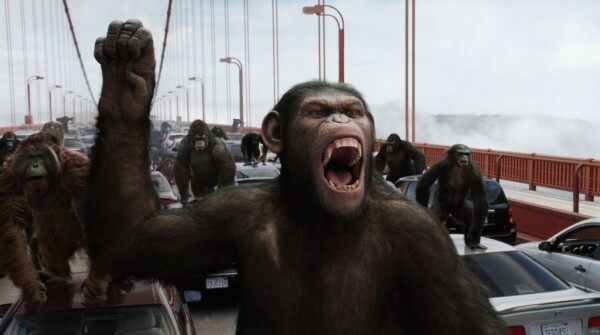 Caesar eventually has to mix with the common apes and instead of obeying the humans he starts an uprising and gets the apes to fight back and escape their grim current predicament. 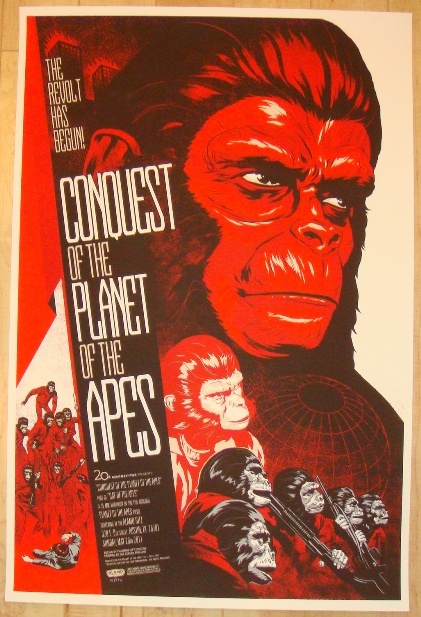 Conquest of the Planet of the Apes is a much more thrilling adventure, darker in tone that the previous film, Escape from the Planet of the Apes. Caesar’s uprising is both shockingly violent and dark considering the film was produced for families. However this helps the film rise above previous instalments and stand on its own as both a prequel and sequel to the original Planet of the Apes. Roddy McDowall excels as Caesar and his impassioned speech in the closing act is perhaps the best scene in the entire franchise. With sharp direction from J. Lee Thompson and a thrilling score from Tom Scott, Conquest delivers everything you love about this franchise, social commentary, brilliant action set pieces and many twists and turns.